On an everyday basis I like to keep my skin care very simple. I use a face wash, a toner and a moisturiser. Over the past couple of years I have tried to figure out what works best with my skin. 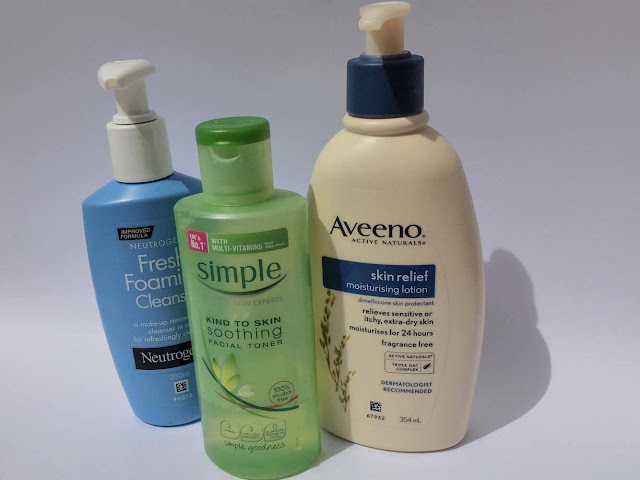 I have tried everything from extremely harsh 3-5 step acne treatments which I find works great for short term but then my acne comes back up and even though I'm still using the products it doesn't go away. I've tried pimple spot treatments which I find works great on a massive surface pimple but doesn't really help to fight what is underneath the skin. What has really worked for me is sticking to a simple face wash, I use Neutrogena Fresh Foaming Cleanser (On the bottle it says that this is also a makeup remover but I strongly suggest you at least use a makeup wipe or something before hand if you are wearing makeup!) I follow this step with the Simple Kind to Skin Soothing Facial Toner, I place a few drop on a cotton pad and wipe all over my face. My final step is a moisturiser, I use Aveeno Skin Relief Moisturising lotion. Finding what works for your skin is a journey, an important one at that! What helps your skin right now may not work in a few month as your skin is always changing! Keeping on top of this can help. In the cooler months is usually when your skin drys out so an extra rich moisturiser even just at night can be very helpful! Another helpful tip is finding out what your skin type is. Oily, Dry, Normal, Combination. Doing some research on each of these and finding which one sounds most like your skin can help point you in the direction of what products to buy. If you are on a tight budget the 2 most important things are an everyday face wash and moisturizer! Research is key! Find out what other people think of a product and what their skin type is, though everyones skin is different this can be beneficial. Have you found your perfect everyday skin care? What are the best products you have tried?